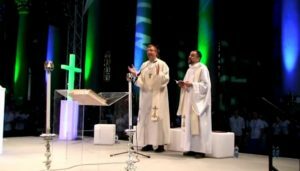 (Rome) What's wrong with the church? 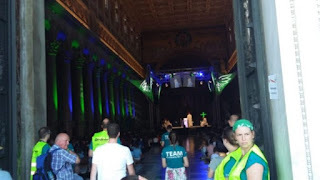 This question is asked by believers after what happened on Tuesday during the pilgrimage of German altar servicers (minis or Ministranten) in the Patriarchal Basilica of Saint Paul outside the walls. Altar servers from different countries were recently in Rome for the 12th International Altar Server Pilgrimage. It is the largest of its kind to date. 50,000 ministrants have come to the Eternal City from the Federal Republic of Germany alone, and another 4,000 from Austria. 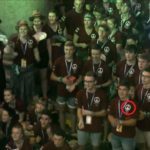 The actual altar server pilgrimage lasted fom the 30th of July to the 3rd of August. On July 31, an incident occurred that caused astonishment, anger and disappointment among Roman believers. Officially, on the morning in the papal basilica of San Paolo Fuori le Mura (Saint Paul Outside the Walls) a Mass for "German Ministrants" should be celebrated. This much did the astonished Romans understand. The basilica is one of the most ancient churches in Christendom. In it, just below the altar, is the tomb of the Apostle Paul. Here he suffered martyrdom and was buried after his execution more than 1950 years ago. At the altar above his grave, only the pope and the sacred bearer delegated by him may celebrate Mass. Eyewitnesses reported that the organizers, i.e. the German pilgrims in charge of the pilgrimage, staged a spectacle in the church that was reminiscent not of the sacred liturgy but of profanation. Indignant witnesses spoke of an "unbelievable, even apocalyptic scene," says Corrispondenza Romana. The church was immersed in a sea of ​​lights that corresponded to a disco or a psychedelic spectacle. "What happened is suitable for a rock concert, but is not suitable for a holy place," said the news site. Choir, keyboard instruments and drums were positioned right next to Saint Paul's grave. The apse and the ciborium of Arnolfo di Cambio was completely hidden. 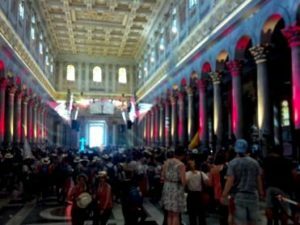 The columns, ceilings and walls of the basilica, which display magnificent works of art, mosaics, frescoes, stone carvings and woodwork, were dipped in neon-colored headlamps such as were used by the Psychedelic Trance Festival O.Z.O.R.A.. Large screens, stages and a multitude of loudspeakers were set up throughout the basilica, which were sounded at full volume. In its origin, the basilica was built by Emperor Constantine the Great and consecrated in 324. Under Emperor Theodosius in 391 it was extended in its present dimensions. On July 31, 2018, it was transformed into a gigantic disco for the German ministrants. The organizers stated that around 9,000 German ministrants were present at the spectacle. Had the majority of the ministrants from the German-speaking world spared the "event"? The ministries of each diocese come only on different days and at different times to St. Paul Outside the Gates. Exclusive right of use "bought" with 18,000 euros? Believers were also irritated that the organizers appointed by the diocese, including a German priest, with incredible vehemence denied all other, tourists, tour guides, ordinary believers, even the parishioners, access to the basilica. 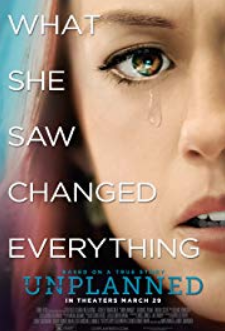 What did they have to hide? Should not their desecration of the venerable basilica be seen? The vehemence was justified by the remark, that they had paid 18,000 euros for the use of the structure, which probably meant no rent for the church, but the cost of the stage, light and audio technology. Anyway, according to Corrispondenza Romana, "the cost of exclusive use of the basilica" was claimed. The Catholic news service reported that Vatican security forces had to intervene to make it clear to the organizers that a "privatization" of the church was ruled out, no matter how much money was spent on the choreography. The "show" was to be continued until Saturday. "Unless someone from a higher place intervenes," said Corrispondenza Romana. Believers complained that already last Sunday, they started with audio samples at the highest volume. These songs were played in the perfect rave party style. "It has long been known that Germans humble and humiliate the sacred liturgy by disfiguring its nature. That they now claim to do this in the house of others is really unacceptable. It is still to be revealed who has authorized such use of the basilica and under what conditions, and what action is now to be taken in the face of the grave, serious and shameful battlefield. " 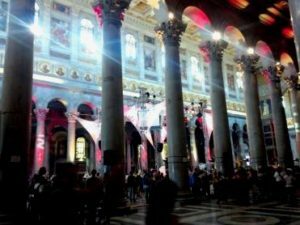 So who is responsible for the spectacle in the basilica? Organizers of the Rome pilgrimage are the diocesan posts for youth ministry. Each diocese set up its own website for the ministranten pilgrimage. There you will find something. According to this, the ministrants of the various diocese were brought to the Psychedelic Trance Festival on different days and at different times. The ministers of the Archdiocese of Munich and Freising, led by Cardinal Reinhard Marx, the President of the German Bishops' Conference, is still fronting the spectacle. For them St. Paul Before of the Walls was on Saturday, August 2 from 5 pm on the program. The keyword is meaningfully "Animazione" including "Diocesan final service with Cardinal Reinhard Marx" from 6:30p. "With a joint service in the Basilica of St. Paul Outside the Walls, the Freiburg program of the International Ministrant Pilgrimage opened. The Freiburg Auxiliary Bishop Michael Gerber welcomed the boys and girls from 250 parish and pastoral units. The motto of the pilgrimage is "Seek the peace and hunt for it." The faces and posture of many adolescents were embarrassed during the spectacle. They are not to be reproached. They were forced to participate. So much is certain: The show was not their invention. 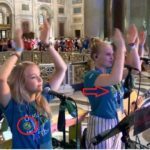 It was given to them from above, because the Church leaders and their full-time apparati are obviously convinced that they have to be "cool" for adolescents to bring them to church. In the Archdiocese of Freiburg, a logo was designed for the pilgrimage, in which two at least questionable or misleading symbols can be seen. Ministrantenwallfahrt Rome 2018: Logo of the Archdiocese of Freiburg with death rune and SED handshake emblem. This is the death rune used by the so-called "peace movement". It was already featured in antiquity as an upside-down cross, and therefore seen as an anti-Christian symbol. At that time it became known as Nero Cross. The Muslims who invaded Europe via Spain in 711 used it out of contempt for Christians. It was also used in the fight against the crusaders by the Muslims in the Middle East. In 1958, the Communist Bertrand Russel sought a symbol for the "peace march" initiated by left-wing groups against NATO. Russell, known for his radical rejection of Christianity, opted for the Death Rune or Nero Cross, though not without ulterior motive. But why should Catholics need to have a reverse cross? 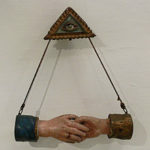 The second symbol is the handshake, also known as Fraternizing Hands, which has been a symbol of Freemasonry since the 18th century. Since 1848 it also belongs to the socialist symbol canon, first used in 1848 by the General German Workers' Brotherhood, which at that time worked closely with the Communist League. 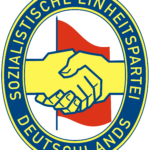 In 1946 it became the emblem of the Socialist Unity Party of Germany (SED). 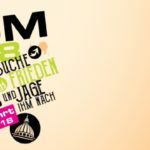 As late as 1998, the CDU placarded the SED handshake symbol in the Bundestag election campaign with the message "Watch Out Germany!" Attention should also be paid to those responsible to the church, which through misunderstanding or even anti-Christian symbolism exposes them to young Catholics. Pope Smiles Upon Altar Girls and Women Priests? Edit: earlier last year, the Holy Father was talking about ordaining women to the office of Reader. Cardinal George, last week, was apparently encouraging a woman that he would discuss the office of Deacon for women when he went to Rome. Fact: Diocese, parishes, Catholic religious societies, which don't have women serving on the altar during Mass are not in demographic free fall. There is no vocations crisis there. As the Church continues to make concessions to the irrationality of the zeitgeist, She will continue to falter and be the willing victim of the media and their political masters. Wherever the Church resists these forces, like feminism, Marxism, and so forth, She is strong. CASTEL GANDOLFO, Italy (CNS) -- Marking the feast of the martyrdom of St. John the Baptist, Pope Benedict XVI said Christians must not bow to the pressure of the powerful who demand a denial of Christ or of the truth he taught. "The truth is the truth and there is no compromise," the pope said at his weekly general audience Aug. 29, the day the church remembers St. John the Baptist's beheading. An estimated 2,500 people gathered in the town square just outside the papal summer villa in Castel Gandolfo for the main part of the pope's audience. Edit: the fact of the matter is that the presence of altar girls and women readers destroy vocations. The presence of women on the altar indicates a progressive and revolutionary outlook which are antithetical and toxic to authentic Catholicism. But a cursory look at the actual practice will show that Diocese which don't allow this don't have vocations problems. Once upon a time Northern Virginia didn't have altar girls, then Bishop Loverde came along, but that's another story. Once the few women of the parish calm down, or decide to become Unitarian or some other religion more suited to their mentality, some vocations to the priesthood should come of this. [Washtington Post] Mass had just begun at Corpus Christi Catholic Church when Jennifer Zickel, a Sunday school teacher, glanced at the church bulletin and saw something that made her sick to her stomach. Tucked in with announcements about a new electronic donation system and a church dinner at Margarita’s Mexican restaurant was news that Zickel, the mother of two girls, had been dreading: Corpus Christi would no longer train girls to be altar servers. Zickel burst into tears and ran to the bathroom. Everything is a Question of "Tradition"
Tagespiegel: "At your departure Mass in the Cathedral of Cologne there were more than thirty servers employed, but not a single girl." 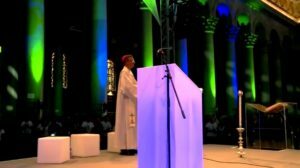 Archbishop Woelki: "In the Cathedral there are no female altar servers. That is a tradition there." Tagespiegel: "Will there also be no more altar girls at St. Hedwig's in Berlin? Archbishop Woelki: "No worry. They will stay. There is another tradition here." 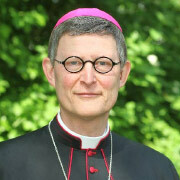 From an interview of the new Archbishop Rainer Maria Woelki of Berlin with the Berlin paper "Tagesspiegel'.